Fox 4 is working to get answers for a Southwest Florida man who says he's owed thousands of dollars for helping clean up after Hurricane Michael in the panhandle. 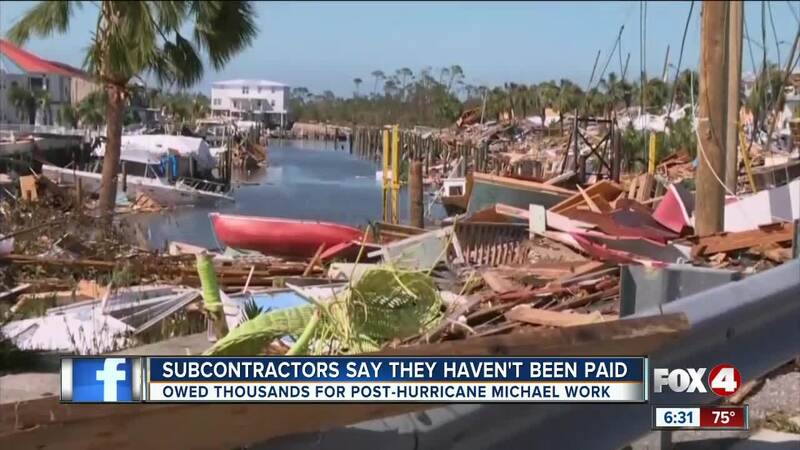 CHARLOTTE COUNTY, Fla. -- Fox 4 is working to get answers for a Southwest Florida man who says he's owed thousands of dollars for helping clean up after Hurricane Michael in the panhandle. "11 hour days, and we worked eight days, so 88 hours. Total it comes out to about $13,800...about that range." That's how much money Richard Sheldon says he's owed by CLM Construction for the work he did removing trash and rubble after Hurricane Michael. Sheldon signed an agreement to be a "push crew" and get paid $150 per hour. But after eight days on the job, Sheldon says he and other crews were sent home and never paid. "I have a group text with people saying they owe $60,000, $20,000, $13,000, $18,000. It's a lot of people that are owed a lot of money." Fox 4 called the phone numbers Sheldon had for CLM, but both numbers were disconnected. Sheldon says he just wants to be paid for work he did. "To give them all the money and not let the employees, the people who are actually doing the work and working out there hard staying away from there families, it's...I don't know, not good." Bo also contacted the Florida Department of Transportation to try and track down the money they paid contractors. They say they're looking into the matter and say they will update us shortly.